The 2016 EU referendum underlined Britain’s differences from its continental neighbours. But it also demonstrated how this ‘united’ kingdom is in many ways very disunited. England and Wales voted one way, Northern Ireland and Scotland the other; and within England the provinces voted against London. Such divisions are nothing new. Clashing interests and identities are expressed in every aspect of British history and contemporary life – not only in politics, but in education, the economy, law, culture, sport, religion and social attitudes. 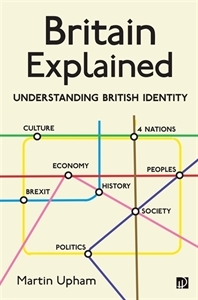 Author Martin Upham spent many years explaining the complexities of British identity to Americans ‘studying abroad’ in London, where he was the director of AHA International (now GEO). This book is based on that experience. The result is a fascinating expedition that will entertain and educate not just those coming from abroad but also his own fellow citizens − whether they are Brexiters or Remainers. 21. A green and pleasant land?